Many small and mid-size retailers are frustrated with inefficient back-office processes that often require repeating certain tasks for online and offline channels. Whether retailers realize it or not, such a lack of coordination can hinder their ability to effectively compete in a multichannel world. While integrated solutions are available, mid-size retailers believe such platforms have been designed for larger businesses, making them either too expensive or beyond the capabilities of a smaller retailer. A single solution expressly designed for small and mid-size retailers, such as Multichannel Order Manager (M.O.M. ), can give retailers the support they need to be more productive and to stay on top of quickly changing retail technology and regulations. By using M.O.M., retailers are not only able to provide a better customer experience but, they can also put more of a focus on what they do best – selling products. It’s a fact of doing business today that retailers need to be in a variety of channels. For many small and mid-size retailers, this could mean operating a consumer-facing website and catalog as well as a multichannel order wholesale business. M.O.M.’s powerful database gives retailers the ability to easily view any customer’s complete history with the brand across all channels. The result is that customers have a more consistent experience with your brand and customer service representatives are less frustrated. Using M.O.M., retailers can also integrate inventory across channels so they’ll always know what’s in stock. There’s an order entry and processing module as well that processes orders via the Web, phone or catalog and integrates with shipping systems. An e-commerce add-on SiteLINK enables retailers to create and manage their Web site. 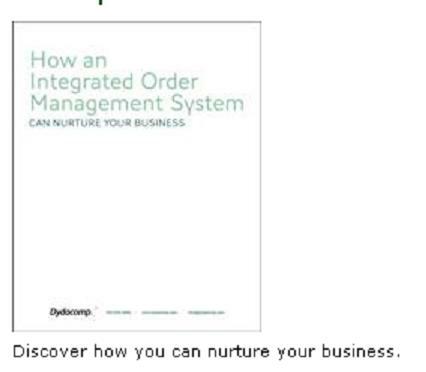 To learn more about how a multichannel order management system can improve your business, click here to view the Dydacomp special report. This entry was posted on Wednesday, August 24th, 2011 at 5:34 pm	and is filed under Ecommerce, Multichannel Order Manager. You can follow any responses to this entry through the RSS 2.0 feed. You can skip to the end and leave a response. Pinging is currently not allowed.